Editable map of Madagascar's regions, built in vector, ready to use. 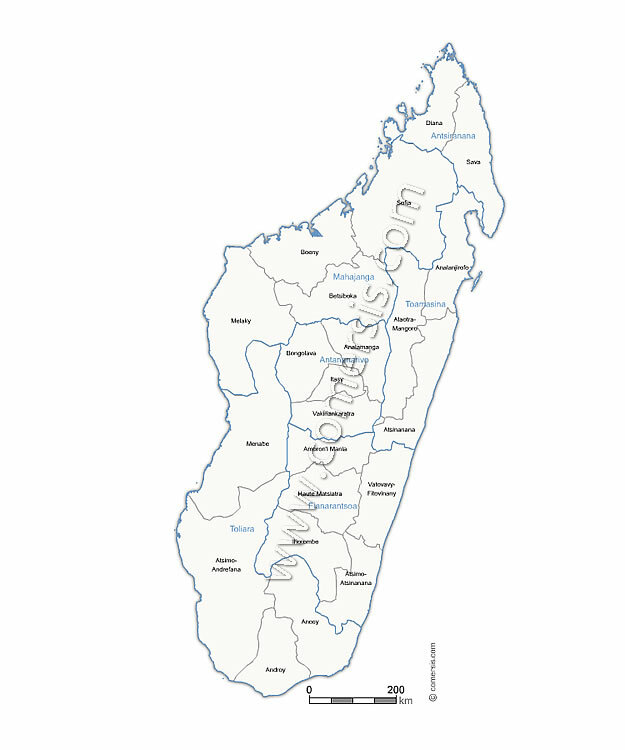 # Resizable : Madagascar regions map for Excel and Word is drawn in vector wich allows a lossless image quality resize. # Splittable : By a simple MAJ+CLIC, you can select one or several areas (regions) of this map in order to create a detail map view (a kind of zoom) and resize it as you need. # Colorable : Each division of this map (regions) is independant. Borders, outlines, shapes, layout, texts can be modified *. # Linkable : You can add hypertext links on text and areas. # Exprotable : Once your map edited, you can save it as a PDF document, a simple image or a clickable HTML web map page*. By default, maps are pre-colored in shades of orange or white. It's just a mouse click to change ! * Read our tutorials.